Entry filed under: Everyday Ramblings. Tags: Aunt Jeffrey, Napoletana Dog. From the angle of your photo, I couldn’t tell what a… delicate animal that was! I submit that its snaggletooth is its best feature. 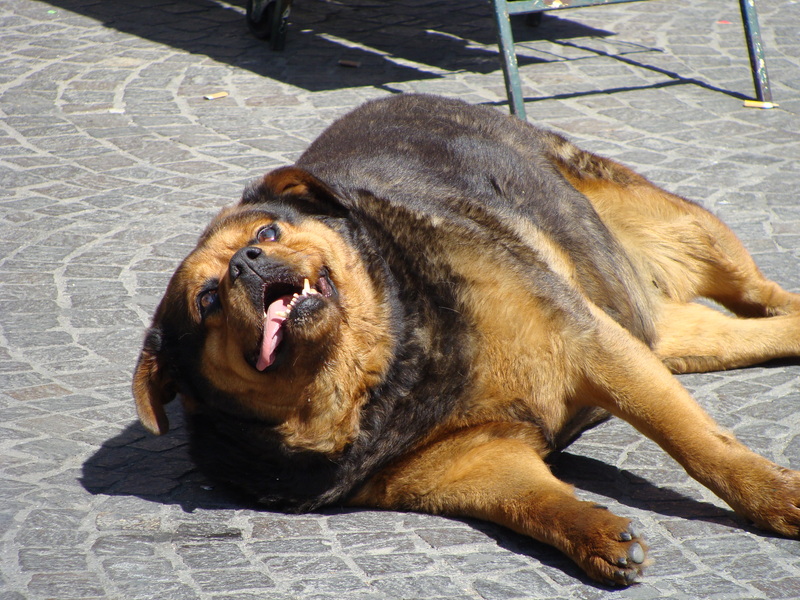 Truly the canine Jabba the Hutt of Napoli. I love the void, glossed over look in it eyes. I think the dog might be mentally handicapped (relative to a dog). HA! That’s hilarious! He’s not he one eating spagetti right? alec: he is a delicate animal isn’t he? kevin: the boss said i could split….what’s a girl to do? and i figured your question could wait ’til monday! It was personal help. I needed a female to pose for an art project I’m finishing up today (Saturday). Le sigh. I had to look at this again… the dog has cankles. And from the angle in the other picture, it’s like a Pillsbury dinner roll gone wrong. Amazing. You definitely need to post its Florentine equivalent. He was a scamp. ahhh cankles……they’re so unfortunate, even in the canine form. Scamp…..you know how much i LOVE that word! “scrappy” is another I adore, apparently, it’s the trait I take on when I drink! Wow, that’s a fat dog!!! I don’t see so many stray dogs in Florence as much as stray cats. HILARIOUS! There is just something so photogenic about this street pooch. She looks pretty scary, and yet she is so mellow. I always find her napping in high-traffic areas. She just expects everyone to step around her and they do. I’ve also seen her dining on leftover pasta. This being Italy, after all, people take pity on the street dogs and give them leftover spaghetti. I’m not kidding! Thanks for swinging by my blog and for pointing out this famous pooch. Maybe I should take more photos and make a collection of Neapolitan Pooch Trading Cards. speaking of feeding Italian dogs pasta…when we were in Sorrento we saw a dog owner feeding his pooch penne with dog food smeared on top. Luckily I got a picture just in time!